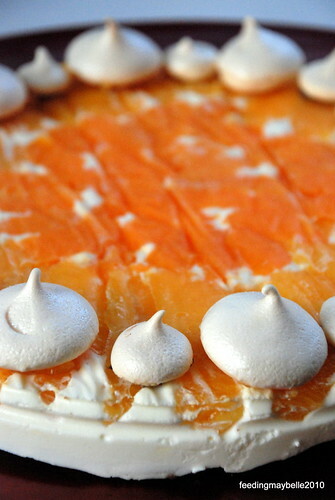 Or wherein I turned the fancy Orange Tian into a good ole Icebox Creamscicle Pie. The Tian was a breezy late winter dessert. All the components of the dessert were old standards in our kitchen—homemade marmalade, supremes of orange, pate sable, and of course whipped cream. I made all the components late in the night, the general baking season for the working mom. It wasn’t until I plated the dessert up that I realized my error. The result looked fairly appealing, but something was off. 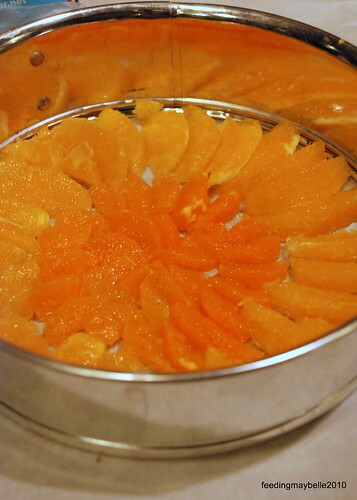 In the sample photo, the orange slices were plump and lovely. Those that topped my tart had were, well, frozen solid. The source of the confusion was quite clear. I read the recipe as carefully as someone can when they are hearing the hokey pokey sung sotto voce, though persistently, in their ear. Somehow I missed the line that said, “Freeze 10 minutes to set.” With a little spin, the folly with the said of some meringues became a nostalgia fueled success. Beautiful! I actually love the idea of freezing it for longer. It's so warm here at the moment that anything cooling/refreshing is most welcome! Your family-sized tian looks fantastic! Great job here! Beautiful job on your tian! I love the meringues, they create a stunning presentation! Beautiful meringue. That is meringue, right? I also have a little one competing for my attention so I had to complete my challenge at naptimes and bedtime. Great job! Hopefully it tasted great. The heart shaped one is adorable!! I am sure it tasted delicious - a frozen creamsicle pie sounds good to me! Yay!! 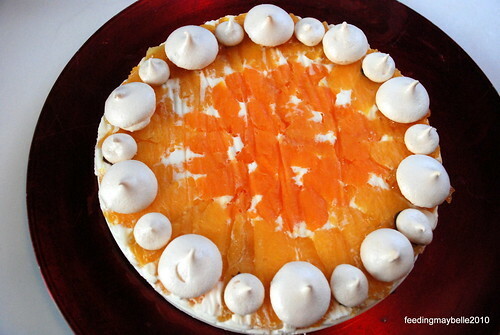 I love how your tian looks - especially the meringue!! Looks so pretty. Was thiss why you said your Tian was messed up? Because you froz eit for longer? But that's fine as I froze mine for three days! I did the same thing! Froze it for awhile (had to defrost a bit before you could eat them =D. I also made meringues - great minds think alike! Very COOL. :) I think it sounds like a lovely frozen pie! :) Looks lovely too. looks SO GOOD! I love creamsicles. I'm not sure I've ever heard of this dish, but it looks dreamsicalicious. Yes! It was like an upscale creasmsicle. Very creamy, dreamy and delicious. 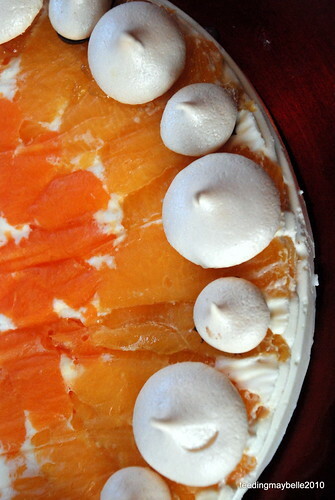 I love the name of your blog, and those meringue kisses were an inspired idea to add even more texture to this dessert. It was a bit like a fancy French creamsicle, wasn't it? LOL! I also had toddlers distracting me and I also left the tian in the freezer too long. When the oranges started to unfreeze, the cream melted like ice cream. Argh! And, yeah, I got the creamsicle comparisons when I served it. Nice save with your presentation. Looks great. oh this looks so elegant! love the vibrant color here. simply awesome! That's funny- I was thinking that it was an icebox pie too! And def. got the creamsicle comparison. I missed that part of the directions too, or rather, listened to my friend who did it first and said, freeze the heck out of that sucker! So I just froze it overnight! :) Whoops. It's a little better when it's thawed, huh? Loved your interpretation of tian! It looks good and tastes delicious and it is an American original now! It looks gorgeous and I would really like the frozen version (I've been freezing a lot of desserts lately actually). I think they actually look very cool frozen :). What a pretty treat! This sounds fantastic as a creamscicle! Definitely a happy accident. Well I think it sounds nice as a frozen dessert! I love your little alternating meringues.